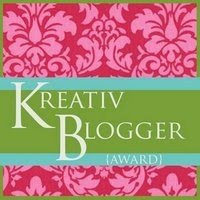 Girls In The Garden, has nominated me for the Kreativ Blogger Award. I am delighted to be included among this group of very talented people...thank-you Lori! 4. Link to those on your blog. 5. Leave a message on the blogs you nominated. These wonderfully creative, stylish women are a constant source of inspiration...I highly recommend a visit to their sites! Thank you, Pamela! I highly appreciate it! Pam, thank you for the award, I'll do as instructed. Hey, I just noticed that you are from the Buffalo area. I'm from Elmira but live in Georgia now. Thanks so much Pam! I really appreciate it! Thank you Pam! I can't believe you thought of me.